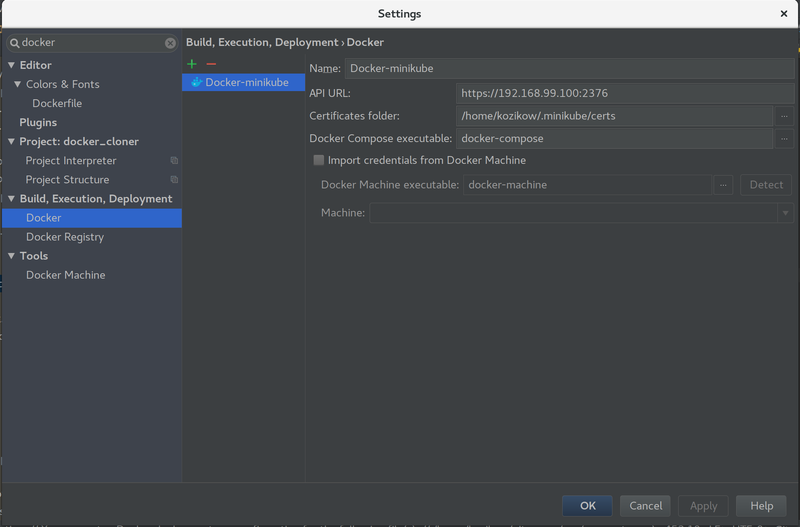 Why use PyCharm docker integration? Why use the same docker environment for PyCharm and minikube? I will write about using docker environment from minikube VM for PyCharm integration. I wish someone would make it work as well with jedi (emacs/vim python completion daemon), but currently only PyCharm supports docker well. IDE features based on python version in the docker image, like code completion, auto-imports, library navigation or type checking. Debug code running inside the docker image using the PyCharm debugger. You don’t need to build the same image twice for different docker environments or rely on docker push/pull. No need to switch between docker environments. Docker, pycharm and minikube installed. You need to replace tcp reported by docker-env with https. Now that pycharm knows how to connect to docker inside minikube, configure a python interpreter as described in https://www.jetbrains.com/help/pycharm/2016.1/configuring-remote-interpreters-via-docker.html . When using docker on localhost or within the docker-machine, pycharm configure binds paths from localhost to the docker image. When using the minikube VM, pycharm decides to bind the path from the VM instead of localhost. I created bug about this: https://youtrack.jetbrains.com/issue/PY-20791#u=1473897921285 . Pycharm run configurations, that allow debugging within code running in the container, rely on binding your project code to /opt/project. Currently, the only option is sharing the path between your localhost and the VM. 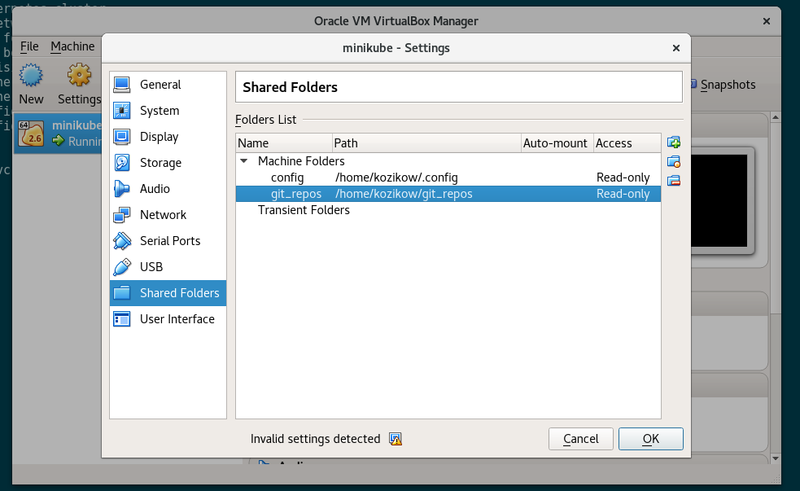 It needs to be configured only once for minikube VM. /usr/local/bin/minikube ssh "mkdir -p /home/kozikow/.config && sudo mount -t vboxsf config /home/kozikow/.config"
The integration is still new, so there are a few bugs. It’s still worth it. All bugs are in the pycharm issue tracker. If you want to use docker compose inside the VM, it needs to be accessible under the same path on localhost and the VM. Sharing the repo with the VM covers this problem. It would be nice if I could debug images launched used kubectl run using pycharm. Images started by pycharm are not started inside kubernetes, so they can’t rely on some intra-cluster features. At this point, the best way I found of debugging an image started by kubectl run would be manually installing Python Debug Server on your image as described in https://www.jetbrains.com/help/pycharm/2016.1/remote-debugging.html , and connecting to it after kubectl run. Thanks a lot! Not very much tutorials about this subject. Will give it a try.